Ties that bind, religion, the opiate of the masses, is the source of the confusion at Malheur. 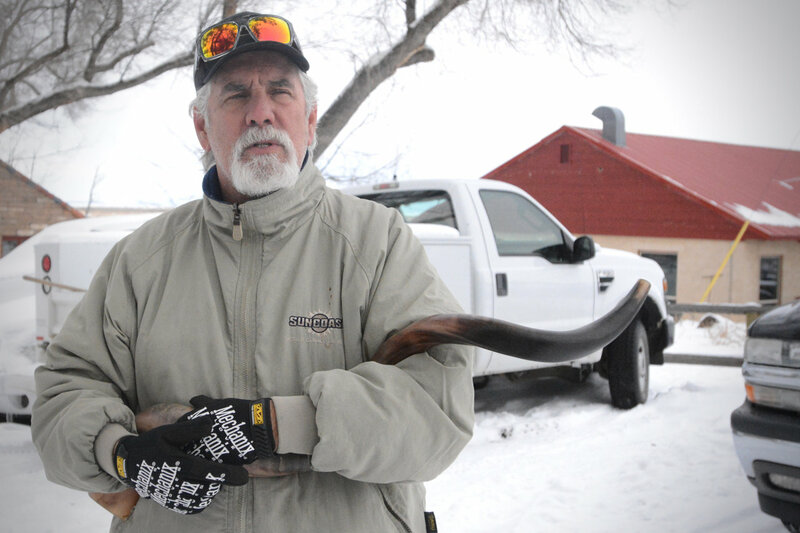 Brand Thornton, 63, holding a shofar, made from an animal horn. He appeared at the 2014 Bundy ranch standoff in Nevada blowing the horn with a rifle strapped to his shoulder. Public records put Thornton in the Las Vegas area. His Facebook page says he owns Just Companies Inc., identified on Angie’s List as a heating and air conditioning company. Oregonian photo & caption info. According to an interview with Brand Thornton, the occupier with the shofar,* <http://homebrave.com/home-of-the-brave//absolutely-god-told-us-to-do-this> there is “a handful of trusted individuals” in the inner circle who see Ammon as the group’s “spiritual leader….” They share his apocalyptic vision. Thornton cites chapter & verse of “Doctrines & Covenants” to justify their interpretation of the Constitution, which many Mormons view as a divinely inspired document that, like the Holy Bible, is improved with latter-day revelation. Beware the prophet saint seeking martyrdom. Shades of Kirtland**, Mountain Meadows, Waco, Jonestown…. The outer circles of gun-toting “militia” are Ammon’s tools. Read the Book of Alma, 17 ff. These guys are preparing for a Holy War. I wonder if the established Church of Latter-Day Saints, based in Salt Lake City, has an intervention squad to deal with this sort of apostasy. This is a problem with religions that encourage followers to pursue their own conversations with the divine. Joseph Smith and other authorized prophets of the church dealt harshly with such “false” prophets. *The shofar was blown when Joshua fit the battle of Jericho, and the walls came tumbing down. The shofar was commonly taken to war so the troops would know when a battle would begin. The person who blew the shofar would call out to the troops from atop a hill. The troops could hear the call from their positions because of shofar’s distinct sound. This entry was posted in Musings, Timely topics and tagged Ammon Bunday, anti-federalism, anti-federalist, Book of Alma, Brand Thornton, Burns, Doctrines and Covenants, Harney County, Malheur National Wildlife Refuge, Mormon anti-federalism, Mormon fundamentalism, Oregon, Oregonian, Portland Oregonian, Sagebrush Rebellion, sedition. Bookmark the permalink.